Mr. Justice Raja Saeed Akram Khan the Hon’ble senior Judge of Supreme Court of Azad Jammu and Kashmir took oath as Acting Chief Justice of Azad Jammu & Kashmir. Hon’ble Mr. Justice Ch. Muhammad Ibrahim Zia. 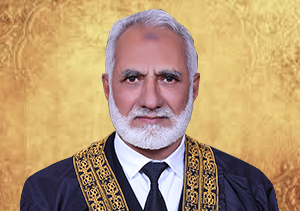 Chief Justice of Azad Jammu & Kashmir administered oath to Mr. Justice Ghulam Mustafa Mughal as permanent Judge Supreme Court of Azad Jammu & Kashmir. The oath taking ceremony was held in main Court room Supreme Court Building Muzaffarabad on Tuesday 4th April, 2017. Hon’ble Mr. Justice Chaudhary Muhammad Ibrahim Zia, senior most Judge of Supreme Court of Azad Jammu and Kashmir, took oath of his office as Chief Justice of Azad Jammu & Kashmir on 25th February 2017. Speach of Justice Ch. Muhammad Ibrahim Zia, In a seminar at the AJ&K University on “The responsibilities of voters under the teachings of Islam”.